Mauro Arbusti was born in Rome and completed his studies at the Conservatory “S.Cecilia” in Rome, where he obtained his diploma with highest honours under Sergio Cafaro. In 2000 he gained his diploma in chamber music, also with high honours, under Marco Lenzi. In 1987 he won a major scholarship which brought him to Hungary to the University of Esztergom to study the Kodály method. Alongside a busy concert career playing in all the major cities of Italy, his international career as soloist with major orchestras and as chamber musician has brought him to Colombia, Venezuela, the United States, Austria, Belgium, Morocco, Spain, Malaysia, Canada and Romania. In the city of Botoşani he presented the first ever performance of the Piano Concerto 4 hands and Orchestra of Carl Czerny with the State Philarmonic Orchestra. He has played for many radio and television broadcasts, (RAI, Radio Nazionale Rumena, Radio Vaticana, etc.) and has participated as adjudicator in various national piano competitions. He has also played with many chamber music ensembles and accompanied many singers, and since 1998, he is then pianist of Ethos Trio, with the cellist Dante Cianferra and the violinist Fabio Cammarota. He has collaborated in the preparation of ballets from operas such as “Aida” for the Greek Theatre of Siracusa and “Rigoletto” for Roman Theatre of Cartagine, (Carthage, Tunisia) and has played music by Scriabin, Schumann, Mozart and Beethoven in new ballets performed by the company “Astra Roma Ballet”, choreographed by Diana Ferrara, “Etóile” of Teatro dell’Opera di Roma. 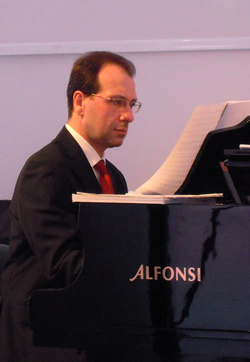 He has been the principal rehearsal/accompanying pianist for National Dance Academy of Rome since 1997; collaborating with the Dance Company “Balletto di Roma” of Walter Zappolini, with some others Dance Companies “I.A.L.S.”, “La Maison de la Danse” and with Denis Ganio and the “ Italian Dancers Association”. He has also played in classes for International Etóiles Roberto Bolle and Natasha Novotna, Francesca Zumbo (Opéra de Paris), Marco Pierin (First Dancer at Teatro alla Scala in Milan), Stefania Di Cosmo, Raffaele Paganini, Alessandro Molin, Hélène Diolot, Sarah Taylor, Cristina Amodio, Shirley Esseboom (Nederland Dance Theatre), Fara Grieco, Francesca Caroti (Forsythe Frankfurt Ballet), Francesca Zumbo (Opéra de Paris) and “Aterballetto” Company. He won in 2009 the international audition as performing/accompanying pianist at the Staatsoper of Berlin, and in 2011 he won the international auditions as performing/accompanying pianist at the Staatsoper of Stuttgart (Stuttgart Ballett) and at the Staatsoper of Wien. He 's now the principal rehearsal/accompanying pianist for National Dramatic Art Academy "Silvio D'Amico" of Rome.